Is Revolution Coming Driven by the Youth? A lot of questions have come in regarding the youth. Many are deeply concerned parents and others are youth who write thanking for the understanding of the truth. I have focused upon the youth because this is part of the generational cycle and the divide between the generations is reaching maximum entropy. This is the force of creative destruction. The two greatest forces of revolution are food and jobs. It was the unemployment of the youth that became a major driving mechanism that transformed China from a Communist State to a Capitalist Society destined to be the world’s largest economy and new financial capital of the world. Both Russia and the West do not understand this mechanism, but it is vital to comprehend for this is a critical element behind the rise and fall of empires, nations, and city states. This is why I have stated that the youth may be the savior of Western Society. Communism in China changed radically with the death of Mao on September 9th, 1976. The Chinese understand cycles, but they also are practical unlike Russia. After Mao’s death, China re-embraced pragmatism. “Seeking truth from facts” became the Party’s new guideline. This is so critical to just allow the facts to lead you to the truth whereas in the West and Russia it has been the suppression of truth to sustain power. Then the most restrictive constraint in China for economic growth was the lack of knowledge. My invitation to China was an eye opener. To walk into a room and see everything you have ever written printed out in volumes and meeting people who read everything showed me that indeed government was seeking truth not trying to sustain power alone. This reform that was forced upon Beijing from the farmers opened the floodgates of private farming as it sprung back to life. China could no longer be controlled from a centralized planning position central to communism and the government responded appropriately whereas in the West government tends to be more authoritative demanding compliance with old ideas to retain control be regulation and threats of imprisonment. By early 1982 private farming became a national policy and the rebirth of capitalism was under way 31.4 years from the birth of Communism in 1949. Chinese collectivized agriculture was therefore dismantled – the first step back toward capitalism – the freedom of being self-aware and deterministic. Of course, the official account of reform credited government for launching agricultural reform when it was very much a bottom-up reform. The Beijing reform merely raised the purchasing prices of grain and increased grain import; which was facilitating the emerging trend of reestablishing private farming. The next great change that forced the Chinese government into capitalism was the vast unemployment among the youth. It was here where we saw the first private businesses in China emerge driven by the people who did not have a job in the state sector. Most were city youths who had recently returned from the countryside. During Mao’s era, we find some 20 million middle school graduates (ranging from 15 to 18 years old) in cities were sent to the countryside simply because the government’s centralized planning could not create enough jobs – precisely the problem we see with socialism in Europe today. Once again, only with the death of Mao, we begin to find the unemployed youth returned to the cities, but still found no jobs in the state sector. The Youth, jobless, and restless, began to take to the streets and even blocked the railway. This mounting pressure forced the government to open the door for self employment. Private shops started to emerge in Chinese cities; they quickly ended state monopoly of the urban economy. The youth in the cities led to the Tiananmen Square Massacre or the June 4 Massacre in 1989. This is why I pay close attention to the level of unemployment among the youth. It is why I take the time to speak to 18 year-olds, To save the world – we need the youth. April 15, 1989 – Hu Yaobang, a former Communist Party leader, dies. Hu had worked to move China toward a more open political system and had become a symbol of democratic reform. April 18, 1989 – Thousands of mourning students march through the capital to Tiananmen Square, calling for a more democratic government. In the weeks that follow, thousands of people join the students in the square to protest against China’s Communist rulers. May 13, 1989 – More than 100 students begin a hunger strike in Tiananmen Square. The number increases to several thousand over the next few days. 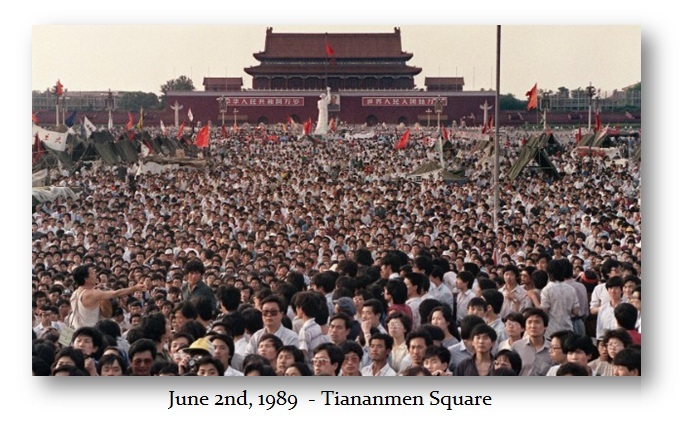 May 19, 1989 – A rally at Tiananmen Square draws an estimated 1.2 million people. General Secretary of the Chinese Communist Party, Zhao Ziyang, appears at the rally and pleads for an end to the demonstrations. May 19, 1989 – Premier Li Peng imposes martial law. June 1, 1989 – China halts live American news telecasts in Beijing, including CNN. Also reporters are prohibited from photographing or videotaping any of the demonstrations or Chinese troops. June 2, 1989 – A reported 100,000 people attend a concert in Tiananmen Square by singer Hou Dejian, in support of the demonstrators. June 4, 1989 – At about 1 a.m. Chinese troops reach Tiananmen Square. Throughout the day, Chinese troops fire on civilians and students, ending the demonstrations. An official death toll has never been released. June 5, 1989 – An unidentified man stands alone in the street, blocking a column of Chinese tanks. He remains there for several minutes before being pulled away by onlookers. June 5, 1999 – Approximately 70,000 people in Hong Kong take part in a memorial vigil.